This certainly isn't the only way to measure the quality or effectiveness of a higher ed system. Nor does it capture all the benefits of our higher education spending. At least some of our costs are driven by elite colleges, for instance, which are still the most admired in the world. We pay a lot for them, and we get a lot from them. But some much these costs are driven by the low end of U.S. higher ed, the colleges that are functionally dropout factories. Unlike, say, Germany with its renowned apprenticeship systems, there aren't really great alternatives to college if you want a middle-class life in the United States. So ill-prepared young adults flood into degree programs they never finish, leaving the U.S. with some of the lowest completion rates in the developed world. In other words, what makes this chart truly galling isn't that we're spending extraordinary amounts of money to produce college graduates. It's that we're spending extraordinary amounts of money to produce college dropouts. 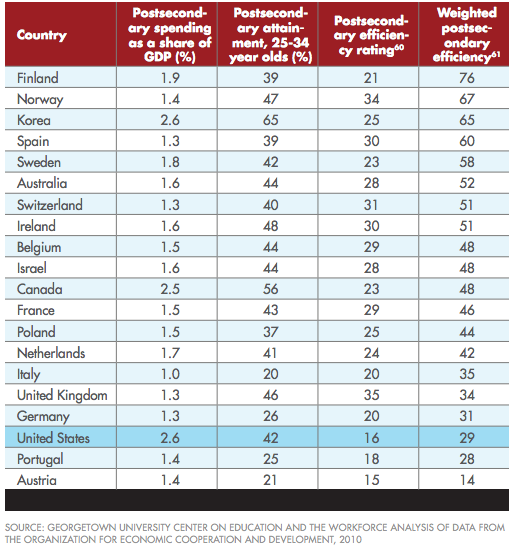 *The weighted measure gives more credit to countries for graduating students from four-year, rather than two-year, colleges, which benefits the United States.